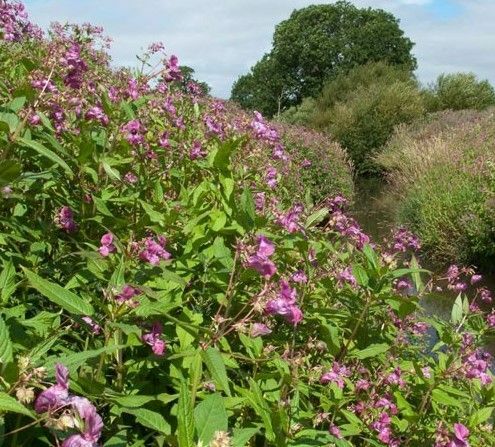 Himalayan Balsam is a large annual weed which many regards as a very pretty plant. The problem is that it is so fast growing it can soon invade all other wanted vegetation in the area. The plant is a naturalised plant found on riverbanks and on wasteland where it is fast becoming a problem weed. In full bloom it can reach 7 foot tall so any form of control can be difficult at this stage. Each plant can produce up to 1,000 seeds which are easily dispersed as the plant ‘shoot’s’ them several meters. Balsam is a tall growing weed and it usually flowers around the June to October time where it tends to produce a purple pinky helmet shaped flower. Following the flower little seed pods grow and these explode when they ripe. The plant is an invasive weed which needs to be managed before it overruns an area. Cutting it back will manage the population but if it is not killed it will just force the plants energy into rooting deeper. A targeted herbicide application is the only way to really control it for good. You either need to apply a strong glyphosate-based product such as Roundup Pro Vantage 480 early spring with repeated applications as and when new growth appears or wait until autumn time and inject the neat Roundup directly into the stem of the plant using a stem injector. This will then take the Roundup deep into the root system as the plant naturally senesces (dies back) for the winter.